We love pizza here. Not the supermarket or fast food type, but properly made from scratch – of course with lots of creamy mozzarella on top. Not only is home made pizza easy to make, so is mozzarella. Knowing you have made everything from scratch is very fulfilling, and filling too! Mozzarella isn’t just for pizzas, it can make a tomato salad into the main course, or a pasta dish extra special (we love adding a little to the top of macaroni cheese before baking). Time wise this is one of the fastest cheese recipes. This mozzarella recipe can be made in thirty minutes, which is also a little dangerous as once you know how to make it you will want to do so quite often too. A food thermometer is a must for this recipe. Take 4 pints of milk out of the fridge and let it come up to room temperature. Add the citric acid to 50ml of warm (not hot) water. I tend to boil the kettle, make a cuppa, then let the water cool for this stage. Give it a good stir to make sure the citric acid is fully dissolved. Pour the milk into a large pan and add the citric acid/water mix. You will then need to heat the milk to 85 degrees Fahrenheit and make sure you keep gently stirring to stop the milk curdling. Add the liquid rennet and continue heating up to 101 degrees Fahrenheit. You will need to gently stir every 30 seconds or so and the milk will start to separate. Remove the milk from the heat, cover, and leave for 10-15 minutes to allow the curd to set. Once the curds are set you will need to cut them. I try to do this in rectangles so even sizes. Use a slotted spoon to remove the curds from the whey and put them into a metal strainer. Keep the whey in the cooking pot and heat to 190 degrees Fahrenheit. Submerge the metal strainer containing the curds into the whey – if not enough whey to cover add some boiling water. Leave in the water/whey until the internal temperature of the curds is 135 degrees Fahrenheit then lift out. You now need to stretch the mozzarella. Sprinkle with the salt – remember this is to taste so add more or less depending on your personal preferences. Now stretch and fold the curds repeatedly until they start to tighten and become glossy. Once tight and glossy you can split and shape into balls. 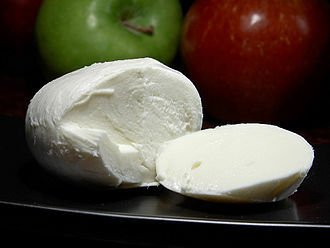 You can store your mozzarella in the cooled whey in the refrigerator and any extra whey can be used in baking. Low Cost Living – The Book!